David Marston is a DJ, producer, and one half of chillwave duo, Dejavilla. Marston, originally from Kingston, Jamaica, is now based in Brooklyn, NY, and is slated to release his debut Feeling You album on March 29. On this episode of Sweet Sunday Radio, Marston shares some new music from his own catalog and some Dejavilla tunes as well. 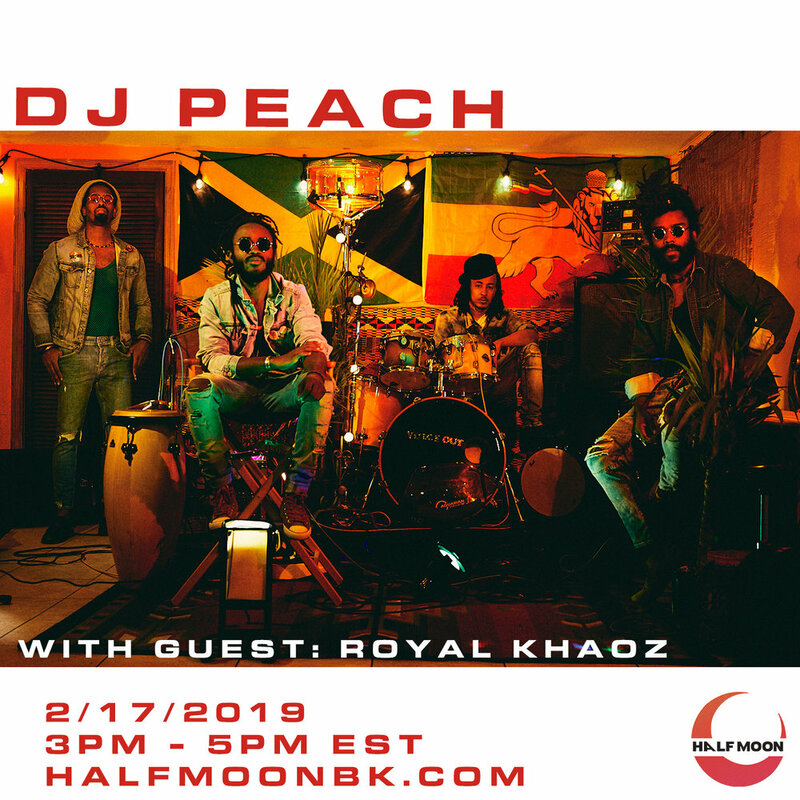 Bronx-based reggae group Royal Khaoz blesses Sweet Sunday Radio on this very special Reggae Edition show. The guys talk about their latest single, “Show Me Your Motion,” and their weekly Voice Out Jams session in the Bronx. UK afro fusion superstar Afro B had explosive success with his hit song “Drogba (Joanna).” The track, which came out in December 2017, only grew over the course of 2018 into 2019, spreading like wildfire around radio and streaming airwaves. The man behind the track, Afro B, took time out of his busy schedule to stop by Sweet Sunday Radio and talk about what makes his music so infectious. In honor of the month of love, this Sweet Sunday Radio is all about the R&B vibes. Ep. 43: Half Moon Debut! DJ Peach has returned! On my very first Sweet Sunday Radio show with Half Moon, I take my listeners on a world tour — from Jamaica to England to Nigeria, Ghana and riiiight back to Brooklyn! DJ Peach dives into some of reggae's newer acts like Lila Iké and Samory I, some classics like Buju Banton and Shaggy, and today's big names like Chronixx and Damian Marley! Reggae vibes! What more can I say? Playlist includes: Chronixx, Protoje, Damian "jr. Gong" Marley, Christopher Martin, Samory I and more. Sweet Sunday Radio Ep. 41: Ghana! Nigeria! Afrobeats! And Beyond! DJ Peach transports from Brooklyn to Africa in episode 41! Yes 41! of Sweet Sunday Radio. Hop on the world tour! Playlist includes: Patoranking, Wizkid, Naira Marley, J Hus, Kojo Funds and more. DJ Peach winds down with some jazzy, groovy, funky, hip-hop-y music (and yes, she just used the word hip-hop-y). Just press play. It'll take you THERE! Playlist includes: Outkast, J Dilla, SiR, Seinabo Sey and more. DJ Mike Nasty (IG: @djmikenasty) joins DJ Peach on yet another Sweet Sweet Sunday! Mr. Nasty gets into his rise from DJing college parties to proving his worth in Atlanta and at last coming into his full creative power in NYC as a producer and DJ spinning at some of the city's best parties. Playlist includes: J. Cole, Xavier Omar, Sango, Ella Mai, Isaiah Rashad and more. DJ Peach streams live from Bedstuy's own Milly's pizza with a dancehall and reggae special! Playlist includes: Stonebwoy, Bulby York, Koffee, Half Pint and more. Music entrepreneur Jaz Woods (IG: @MissJaz_) joins DJ Peach on episode 37 of Sweet Sunday Radio. The ladies get int working in music, maintaining balance and tackling your passions and how they stay peaceful, loving, positive and most importantly, "nice with boundaries." Playlist includes: Chaka Khan, Mac Miller, Kendrick Lamar, Jay Rock and more. Filmmaker and independent media producer Gavin Webb (IG: @_gwebb) joins DJ Peach on Sweet Sunday Radio to talk about his various creative projects, from Stoop55 where he and business partner Steven "Small" Warner showcase Brooklyn artists via online interviews and an annual block party to his upcoming documentary based in Uganda. They get into what makes NYC such a creative hotbed and how the sound of the city's music has evolved over time. Playlist includes: JAY-Z, Nipsey Hussle, Kendrick Lamar, H.E.R., SZA and more. After a few week break from Sweet Sunday Radio, DJ Peach returns to the mic with some chill gray day tunes. Playlist includes: Estelle, Janet Kay, Bob Marley & The Wailers, The Platters, Bill Withers, AlunaGeorge, Mac Ayres and more. Following the loss of the great Aretha Franklin, DJ Peach pays homage to the ladies of soul and jazz. Playlist includes: Aretha Franklin, Etta James, Ella Fitzgerald, Billie Holiday, Dinah Washington and more. An eclectic mix of hip-hop, R&B, reggae, Afrobeats, music from Brazil, Cuba and a game of who-sampled-what. Playlist includes: Souleance, Black Star, Tracy Chapman, Christine Alicino, Don Gehman, Tracy Chapman, The Pharcyde, Joe Arroyo and more. DJ Peach celebrates her 25th year with the one and only DJ Afro Pick (IG: @miss_mikaela_a) on this special bday edition of Sweet Sunday Radio! Playlist includes: A$AP Rocky, Jah Cure, Protoje, Damian "jr. Gong" Marley, Childish Gambino and more. On episode 31 of Sweet Sunday Radio, DJ Peach wants you to dance and feel the best you've felt all week. It's the summer, dammit! Enjoy the sunshine (or rain! ), find the local dancefloor and put your dancing shoes on. It's about to be a good time. Playlist includes: Earth, Wind & Fire, Martha & The Vandellas, The Jacksons, Stevie Wonder, Sly & The Family Stone and more. Ep. 30: Girls Run the World! A celebration of the ladies of the world doing their thing and doing it well. In this episode of Sweet Sunday Radio, we travel from Jamaica to England to Africa the states and more, nodding our hats and gold hoops to all the feminine energy out there. Playlist Includes: Koffee, Karol Conka, Spice Girls, Jorja Smith, Nai Palm, Tiwa Savage and more. DJ Peach comes back from a hiatus and gets hot and heavy into the summer lovin' cuts! Playlist Includes: Ella Mai, Naomi Cowan, Teyana Taylor, Khalid, Drake, Damian Marley, and more. DJ Peach does a quick show showcasing new hip-hop tracks, from JAY and Bey to Nas, Pusha T and more. It's a vibe! Playlist includes: A$ap Rocky, JAY-Z and Beyoncé (The Carters), Nas, Sheck Wes, Jay Park, 2 Chainz and more. Ep. 27: Put That On My Set! DJ Peach plays some hip-hop from Germany to Harlem and gets into some EXTRA SMOOTH R&B. Trust me, you'll love it! Playlist includes: Ace Tee, Rick Ross, J Hus, Stormzy, Skepta, FKA Twigs, 070 Shake and more. DJ Peach takes listeners on a world tour with this eclectic mix! Playlist Includes: Boogaloo Assassins, Mavi Phoenix, Gnonnas Pedro, K Frimpong and his Cubano Fiestas and more. DJ Peach brings Brooklyn's DJ Plug (iG: @hokageplug) to the KPISS stage and they collaborate on a playlist of alllll kinds of that goooood good music! Playlist includes: King Ezz & Lambo Vangogh, GoldLink, J Cole, Miles Davis, Biig Piig and more. Ep. 24: Sweet Summa Vibes! A sunshine-y playlist to kick off the summer! Playlist includes: Pierre Kwenders, Blood Orange, Toro Y Moi, Tame Impala, Unknown Mortal Orchestra and more. On this episode of SSR, DJ Peach plays a very special brand of R&B: Paley-n-B: A little bit melancholy, a little bit saucy, a little bit heartfelt. DJ Peach is joined by Brooklyn-based artist Hidden Luxury (IG: @hiddenluxury) -- a.k.a. Brittany-Symone a.k.a. DJ Bartender -- to talk female-centric art and listen to an all ladies playlist. Cha-ching! Playlist includes: Kali Uchis, Erykah Badu, Amy Winehouse, Sade, Kelis and more. On this episode of Sweet Sunday Radio, DJ Peach brings her throwback game -- all the way back to 1970-something. Enjoy! Playlist includes: Marvin Gaye, Stevie Wonder, Curtis Mayfield, Sly, The Family Stone, Tavares and more. DJ Peach invites the Cosmic Boys of Brazil (IG: @cosmicboysofficial) onto Sweet Sunday Radio to talk about music, art, and life and play some global sounds from around the world! Playlist includes: Jorge Ben, Sergio Mendes & Brasil '66, William Onyeabor, Quantic & Nickodemus and Orishas. Playlist includes: Snoh Aalegra, Sza, Drake, Wale, J Cole and more. TIDAL Latin music editor Melissa Vargas a.k.a. DJ Mely V (IG: @mellyyvargas) joins DJ Peach play 2 hours of Latin music. This playlist walks us through the music that's hot now and the songs that have kept generations dancing from the '50s onward. Playlist includes: Bad Bunny, Lary Over, Nitty Scott, Maluca, Orishas, Mc Fioti and Major Lazer. The one and only DJ Afro Pick (IG: @miss_mikaela_a) joins DJ Peach to celebrate Women's History Month with a playlist of powerful female hip hop and R&B artists. Playlist includes: Mary J Blige, Leikeli47, Foxy Brown, Erykah Badu, King and more. Jamaica-born, Bronx-based singer-songwriter Allexion -- a.k.a. -- DJ AX (IG: @allexionx) joins DJ Peach on Sweet Sunday Radio to talk about their mutual favorite subject - music! Playlist includes: Daniel Caesar, Lauryn Hill, Erykah Badu, Stephen Marley and more. DJ Peach invites her hometown friend DJ Art Mason a.k.a. Rup (IG: @art_mason) of ATL's legendary Tree Sound Studios to talk studio life, ATL hip hop, creating without boundaries and more. Playlist includes: Koffee, Jah9, Rae Sremmurd, Joe Arroyo, Good Gas and more. A mix of love tunes — for those in love to those falling out of it and all in between. Playlist includes: Dr. Lonnie Smith, Stevie Wonder, Barry Biggs, Barrington Levvy, Sade and more. Alt-soul singer Olu Bliss comes on Sweet Sunday Radio to talk about music and happiness! Playlist includes: Rorystonelove, Damian Marley, Kali Uchis, Tyler, The Creator, Bootsy Collins and Air. Stylist Kenya Sherron (IG: @kenyasherron) talks fashion and music with DJ Peach on SSR Ep. 12! Playlist includes: Outkast, Kendrick Lamar, Loyle Carner, Stevie Wonder, Judith Hill and more. DJ Peach invites her frenemy, fashion designer Adam Blake (IG: @adamdblake) and her wonderful neighbor and fashion expert, Dan Gustina, onto Sweet Sunday Radio to play some divalicious music and laugh! Playlist includes: Beyoncé, Cher, Chaka Khan, Cardi B, Mariah Carey and more. Playlist includes: Bobby Vinton, The Platters, The Roots, Camila Cabello and more. DJ Peach plays strictly '90s NYC rap this week. From Junior M.A.F.I.A. to Murder Inc., this hip-hop is oddly compatible with these long, contemplative winter months where the weather's miserable but your new fur coat makes you feel fabulous. Playlist includes: Junior M.A.F.I.A., Mary J. Blige, Method Man, Puff Daddy, Notorious B.I.G., Foxy Brown and more. 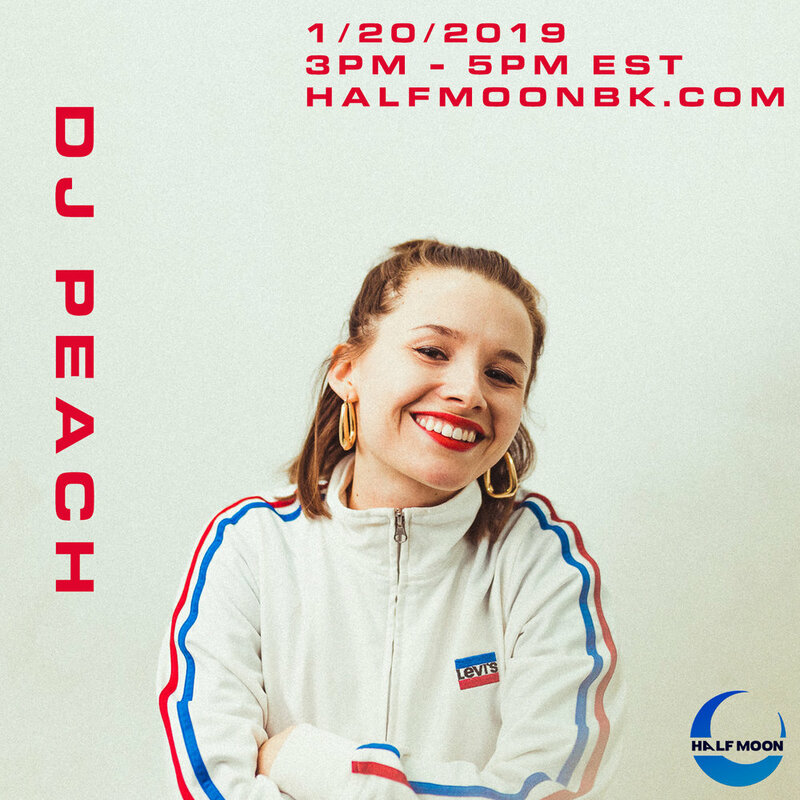 This week, DJ Peach taps into some serious vibes, from electronic-leaning alt rock to R&B and soul, these two hours are guaranteed to take you on a super sweet journey. Playlist includes: Charlotte Gainsbourg, Tame Impala, Nick Murphy and KAYTRANADA, Unknown Mortal Orchestra, Jamie Lidell and more. At last! DJ Peach does her long awaited and highly anticipated dance show... and it as just as sweet as she envisioned. Playlist includes: Davido, Tekno, Mr. Eazi, Fuse ODG, Tiwa Savage and more. DJ Peach talks with Brooklyn-based singer-songwriter Geminelle and gets into some of their collective soul, R&B and neo-soul favorites. Playlist includes: Wildcookie, Freddie Cruger, Anthony Mills, Nxworries, Bilal, Geminelle, Robert Glasper Experiment, Jill Scott and more. DJ Peach and Mikael a a.k.a. the woman formerly known as DJ Afro Pick (IG: @Miss_Mikaela_Allen) take a trip back to their native region in this week's Dirty South playlist. Playlist includes: Goodie Mob, Outkast, Nappy Roots, Ludacris, Ying Yang Twins, T.I. and more. DJ Peach delves into all things Latin: love, lust, life heartbreak and, well, krippy kush. Playlist includes: Esso Afrojam Funkbeat, India, Nitty Scott, Danay Suárez, Toña la Negra and more. DJ Peach talks to the founder of Brooklyn's Tunnel Vision Arts collective (IG: @TunnelVisionArtists), James Malone (IG: @jdmalone), and gets into a playlist of sweet, soulful tunes. Playlist includes: Roy Ayers, Frank Ocean, Nipsey Hussle ft. J. Stone, Damian Marley and more. DJ Peach talks with this week's guest host, photographer Brandon Thomas Brown (IG: @brandonthomasbrown) , about his work and the show's playlist theme: women! Playlist includes: Kehlani, Chaka Khan, Sade, Snoh Aalegra, Teena Marie and more. On the first Sweet Sunday Radio show, DJ Peach's mom, Pam, stops by to talk about some of their collective favorites. Playlist includes: Destiny’s Child, Brownstone, Carly Simon, Elvis Costello, Sergio Mendes and more.